This is not a new book. 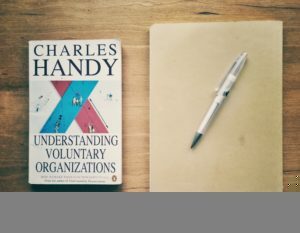 It was published first in 1988 and yet it focuses on an important subject – how do you make ‘voluntary’ organizations function more effectively? There are a vast array of third sector organizations that play a big role in society – charities, faith groups, political, sports and community bodies. The topic of improving the effectiveness of these is therefore still very important and few management thinkers have ever been in quite such a good position to advise on it as Charles Handy. Fortunately this book stands the test of time. It is brief (pointing readers to the substantial sister volume ‘Understanding Organizations’ for more detail) and highlights fundamentals that shape organizational effectiveness, providing an insightful angle on their special significance for voluntary organizations. It is not a cookbook but more of a framework and tool for those seeking to examine their own organization. The danger of the ethos of the organization getting in the way of the goals of the organisation so that it becomes a goal in itself rather then the means to an end. Real clarity of purpose and method is needed to avoid this. Otherwise the organization can easily fall into the pockets of whoever are the ‘paymasters’ and their agenda. This flows from the economics of the gift economy where, because of the cause, a ‘make do’ mentality grows up undermining quality or driving responses to every need. This leads to staff burn out and undermines the sustainability of the organization. This can arise because success, structure, professionalism or leadership are seen as threats to the purity of the cause – being united together for the goal. Yet these factors are vital to avoid ineffectiveness. Handy starts by setting the scene. He highlights the three broad overlapping roles for this sort of organization – mutual support, service provision and campaigning (research and advocacy). He explains that each role often carries an unspoken assumption about how they should operate. Mutual support needs servicers, service provision needs organization (to deliver) and campaigning ones need believers. The first don’t like organization, the second want managers and the third leaders. Yet often their missions overlap as they develop and it is then that friction increases as the cultures and structures that match each category collide. As is the case with all organizations, increased complexity creates issues and inefficiencies. In advocating the value of good organization Handy helpfully recognises the challenge of ‘management’ language to the ethos of volunteering. He is a great defender of good management and highlights its essential quality – the fulfilment of the organization’s goals, with their clients, providing services and doing this within the financial and other resources available. Communities cannot do this without being organized in some way – so they key is to choose the most appropriate way. He has no admiration for ‘amateur hour’ although he recognises that it might be better to organize without the language of management or the engineering metaphors – something that I heartily agree with. The aim is to highlight important topics and inform with research based insights into the good practices and challenges in each area. These can help reflection on better ways to do things – good for anyone in the organization. Releasing the ‘E’ (energy, effort, enthusiasm) in people in an organization demands that we understand what environment is needed to spark this. This observation in itself is valuable and oft forgotten. The presence of an ‘unwritten contract’ in the commitment we make to an organisation. This comprises elements that motivate and reward us (cause, money, status, responsibility, ability to use a talent..) set against the effort and energy that we are required to put in. These are different for each individual but there is insight to be gained from motivational theory (Maslow etc). We can help or hinder people’s drive by our approach. e.g. more specific goals and measures of success can be motivational; when we see ourselves being stretched we are attracted; when we see a strong risk of failure we retreat and need to consider if the contract remains in balance. Understanding each person has a different contract, but people do like targets rightly used and feeling good about what they achieve. These are insights that have simply been reinforced not changed with more recent research (see for instance ‘Drive’ by Daniel Pink). Handy explains that research shows that we like roles. Defined well they help with clarity of purpose but definition can also create stresses around role conflicts, ambiguity and work overload/underload. Failure to get the right level of definition and workload leads to people filtering work (e.g. just to the urgent), withdrawing (physically or psychologically) or displacement. All produce averse results for the organization and the individual – and can often be seen today in many organisations. It is critical that people understand the core of what a role is about, its boundaries, the fluidity within this and how success is to be measured. Roles then provide an identity and character to play. We tend to own and play the role better with good definition. Handy starts by outlining the difference between a team and a committee and the need not to confuse the two! He then identifies the priority when considering groups – the need to be clear first what the purpose of the group is (i.e. not the role of the individuals but why the group as a whole exists). Clarity over this both guides agenda and form for the group. These should reflect the purpose of the group – distributing work, problem solving, making decisions, resolving conflicts etc. Once clear this helps creates a sharper focus on the size of each group, how it needs to function to fulfill its task, the composition of it, its development (forming, storming, norming and performing) and its approach to concluding decisions (e.g. how participative?). A useful order and checklist. The quality of group life depends on great clarity over the task and the quality of the process it follows – especially avoiding group-think (by preventing self-perpetuating membership, ensuring key decisions come to a senior group without any specific recommendation and that outsiders periodically attend. It is naive to think that voluntary organizations do not have people who engage in power plays or seek influence (arguably their commitment may make it even more common). it is helpful to recognise the styles and sources of influence at play in any specific situation. Research highlights seven styles of influence: reason, friendliness, coalition, bargaining, assertiveness, reference to higher authority and the use of sanctions. These can be exercised from different power sources: positional, expert, personal or resource power. People with greater power typically use more influence styles and the greater the relative power more authoritative the style often used. None of this is very surprising but very helpful for reflection when many feel that voluntary organizations should almost be democratic. Other helpful observations from the research are that the greater the bureaucracy the more likely positional power is used. The evidence is that power often gets abused, especially blocking and gatekeeping. It therefore needs accountability. He also usefully reminds us that internal competition is not a pariah nor necessarily ‘conflict’ . It can be beneficial – growing the cake and raising standards if it is open, fair and forgiving. In this section Handy highlights important aspects of organization that typically grow up with little reflection in the voluntary sector and yet by their nature may tend to persist for longer than is helpful and normal in commercial organizations. All organizations are communities and not machines and therefore as with all groups they have own character, which we call their culture. Handy identifies four classes of culture. This is a great basis to start a discussion from or fuel consideration of healthy or unhelpful aspects of organizational behaviour. Any organization is likely to have a mixture of these but it may well be dominated by one because of its heritage and role. Club (power) culture: This is where the organization is simply a spiders web that extends the influence of the key players. It will often reflect intimacy with these personalities rather than function. It makes for a very personal organization which thrives where good performance demands speed and personality. Role culture: This is very different and builds structure around the individual roles in the organization chart rather than the individuals. It is ruled by the need for harmony, rules, rationality and order. Everything is more managed than led – with formalised communications and people playing to their role. They thrive in stable times when well aligned to the environment but struggle when the environment changes especially if it does so constantly. Task culture: This thrives where problem solving is important and where the specific tasks are more varied and need speed – more bespoke projects, events or actions. The resulting excitement and achievement focus needs co-ordination and teams. These organizations offer little in the longer term beyond this and therefore thrive on youth and talent. Person culture: Here the organizational purpose is the personal purpose of the individual not commitment to a great cause – a star doctor, barrister, architect or campaigner etc. The result is that professionals outrank managers and organizational disciplines are weak. Reality is an organization which is a mix of all these shaped by their history, environment, size and the flow of work. The value to be unlocked is to understand what the culture looks like and then assess the extent to which it matches the needs of its role and environment. Subsidiarity: How far is responsibility pushed towards the coalface? Or does the organisation create too many low-skill, narrowly focused roles, almost as if because they are not paying someone for the work then the role should be of such small value that no-one would expect payment. Differentiation vs Integration: Organisations have to manage the diversity of tasks that need to be done and yet integrate these into the composite that the organisation must deliver. The design needs to be diverse enough to handle services, geographies, channels and functions but Handy believes that voluntary organisations often fall into the trap of a single service focus with wide regional diversity even when this is inappropriate. Integration mechanisms: Integration between the different areas can be achieved through hierarchy, procedures and co-ordinating groups. Most organisations use all three but typically develop from the first through to the last and can therefore end up with too much hierarchy (and often by default a heavily role based culture). Flexibility and responsiveness comes from a flatter structure and other integration approaches. Federalism: This is where all that remains at the ‘centre’ is the residual elements that cannot be executed in operating units or groups. The energy and initiative comes from the units. This ‘tight-loose’ structure means that the centre often focuses on holding only onto a few things like new money and people, with the ‘hows’ being left to the units to define. Responsibility is delegated and the focus then becomes results more than methods. Shamrock: Three petals that reflect the way staff are handled – a professional core, contractual fringe and flexible workers. Each has a slightly different ‘contract’ with the organisation and therefore should be handled differently. Voluntary organisations may be slightly different – with a professional core and flexible volunteer fringe (although sometimes it also needs a flexible contractual fringe too). The needs, motivations, expectations and treatment of each of these groups should be different and need to be handled appropriately. Communications: He first calls out what we all too readily forget – the immense challenge and ineffectiveness of communications generally. Over half of all information communicated is almost immediately lost by those receiving it and this is made instantly worse by distance, a lack of trust, distortions by sender and receiver and the ambiguity of language. Leaders therefore need to use at least two media and forms, shorten communication chains and make them as interactive as possible to overcome this. Good advice. Numbers: He identifies that ‘hard’ goals (those with numbers) will always end up being treated more seriously than ‘soft’ ones and that therefore numbers need careful thought if they are to help rather than hinder progress. Rarely are mere financials the most important metrics. It is important to identify the various levels of success for the organisation (treating it as the means to the end rather than an end in itself) and appropriate measures for these. These should scope the tasks that help to advance the purpose of the organisation and measure the success of these tasks in a period of time. This is often done poorly in many organisations. Designing them needs careful thought – before or after the event measures? individual or group effort? is the metric relevant to the size of the base (e.g. %)? is there a clear route to calculating it that reflects its use? He also identifies the unavoidable challenges inherent in budgets. This is a really valuable insight for leaders and should provide a powerful push to find or create much more appropriate numbers than most voluntary organisations use. Too often organisations use what’s there and easy – rather than what is helpful and the result is a significant skew that increases cynicism and miscommunication in staff. Participation: Especially in a voluntary organisation there is then a third key system that helps to ensure the accountability of the organisation to its stakeholders. This comprises the forums and processes that hold organisational leaders to account. He highlights important considerations e.g. the difference between participation in executive decision making and policy making or the difference between consultation, consent or consensus. In and of itself it is a great challenge – how do stakeholders participate and hold to account the oragnisation? The epilogue discusses the challenge of change in organisations, reflecting on the general resistance to it and yet the desirability of organisational development. He suggests ways to mitigate three big blocks to change and comments on levers for change. The chapter is has one or two useful insights into a big topic. Blinkers/filters: We like to adjust reality to our preferences and so miss obvious threats or undesirable changes. Handy’s remedy to this is bake-in exposure to outliers, opposites and opportunities into the operating model by carving out senior time in a structured fashion to reflect on these. Certainly valuable – and rarely or often poorly done. The predictability imperative: Organisations love predictability even more than individuals hence assiduous planing, cartels, rules, categories and intolerance of non-conformists. Handy suggests better environmental scanning, counter examples and the use of ranges and uncertainty in plans to help unlock thinking. Again good ideas that are rarely used. Coalitions: These form naturally and once organisations stop growing they can easily solidify and impede adaptability. He identifies mitigations in robust policies to prevent self-serving governance, fixed-term appointments, federalism and better participation. When he turns to change levers he helpfully identifies Harold Leavitt’s diamond model as a useful framework for actions with its four dimensions of task, structure, systems(technology) and people. This emphasises the need to consider all four when changing any one – not merely relying on the one or two that a particular culture might naturally reach for ineffectively. He also explains the power of particularly task definition and the numbers system as levers that can change organisations powerfully over time – much more reliably than swapping people or roles (despite the norm in change being the reverse!). However, he concludes by pointing out that if we want exciting, developing organisations then they come fundamentally from encouraging the people in them to be like this and take initiative, set themselves higher standards and press for new and better outcomes. Overall this is a helpful book with some great material for leaders in the voluntary sector to chew on when considering issues in their community or the effectiveness and development of their organisations. Time does not blunt the value of the key messages … even for commercial entities.